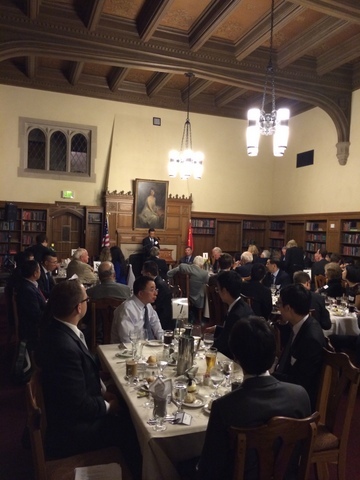 The event was chaired by Professor Zhao Suisheng, Director of Center for China-US Cooperation, with participation of about 80 scholars on Chinese affairs from <?xml:namespace prefix = "st1" ns = "urn:schemas-microsoft-com:office:smarttags" />America and the UK as well as the faculty and students of the University of Denver. 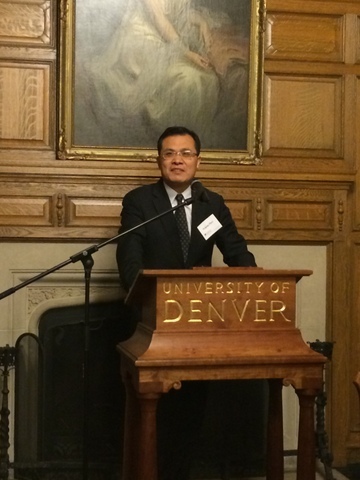 Ambassador Christopher Hill, former US Assistant Secretary of the State and Dean of the Josef Korbel School of International Studies at the University of Denver, delivered welcome remarks to all guests at the beginning of the dinner. Consul General Zhao emphasized in his speech that China has found a path suitable to its national development, that is, the path of socialism with Chinese characteristics. No matter how international situation changes, China will firmly adhere to this path, and China is fully confident in its future. China will as always attach great importance to China-US relations, with the goal of building the new type of major country relationship featuring "no conflict, no confrontation", "mutual respect" and "win-win cooperation". This September, President Xi Jinping will pay a state visit to the US at the invitation of President Obama, which will provide another important opportunity for the development of China-US relations. This visit will certainly give great new impetus to the mutually beneficial cooperation between the two countries and open even more promising future for the development of China-US relations. After the speech, Consul General Zhao also answered questions from the audience.